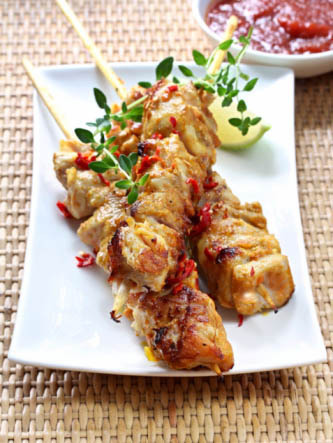 Make Delicious Satay Recipes from the comfort of your home! The Indonesian Satay (pronounced "sah-tey"), or in Malay Sate are a family of traditional dishes from Indonesia, Malaysia, The Philippines, Singapore, Thailand and have also conquered The Netherlands. The authentic satays are small skewers of grilled chicken, pork or beef meat. The meat is almost always marinated in an exotic sauce more or less associated with cumin, chilies, turmeric, ginger, cilantro, pepper, garlic, ground peanuts, etc.. It is served with sliced cucumber, cubes of compressed rice or ketupat, raw onions and sometimes covered by the famous satay peanut sauce. Following the colonization of Indonesia by the Dutch, this dish is now extremely common in fast food restaurants of the Netherlands, where the satay sauce is also regularly used as an accompaniment to french fries... A perfect cultural blend! Together on this site we will explore with you this delicious asian culinary tradition and provide some great recipes to make homemade authentic satay recipes right from the comfort of your home... and I will not limit myself to chicken Satays, as suggested in the domain name. 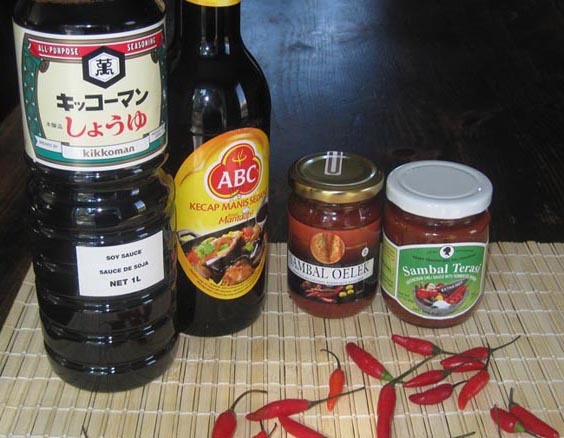 Well to make a Satay that comes close to the original asian dish, you will need some real asian ingredients; please do not rely on those generic western sauces sold at the local store for the real thing. Satay is an exotic dish, so it needs special ingredients! Do not worry however, most large cities have a "Chinatown" or asian neighborhood; in those areas you will find almost everything you need for Satay... Then take a look at the tools that will help: strongly recommended but not essential is a backyard barbecue, gas barbecues are great but to render the full flavor there is nothing like charcoal; then the kitchen oven comes as last choice, although you can still make some delicious Satays using it, but it isn't the best choice. Sambal Terasi: Indonesian shrimp paste sauce.